Earlier this year I was trying to outline my career goals, and I kept coming back to the same thing. I want to see my work in a gallery. Coming from a more commercial art background, going in a more fine art direction seemed terrifying and completely out of reach. I decided the best way to approach my first gallery show would be to work with a few other artists and produce it independently, and after contacting my friends Emily Taylor (of Cabin Journal) and Yuli Schiedt the inspiration and ideas started flowing. I had been working through some ideas in my work about the power of being vulnerable, and the strength that comes from being emotional, opening up, allowing yourself to be soft. We began building the show around the theme of SOFT POWER, and brought the talented flower sculpture artist Lee Meszaros into the mix. What we created was a total dream. 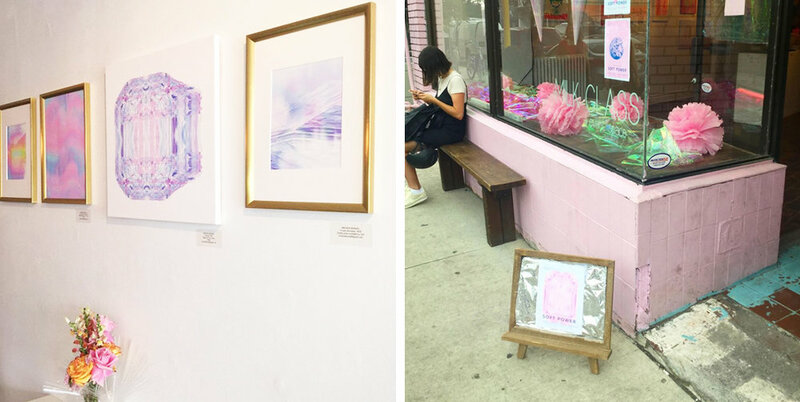 A gallery show and pop-up shop that ran for a full week in August, celebrating softness with so much whimsy and colour (especially pink!) through photography, painting, digital art, and sculpture. I spent an entire week feeling completely high, so proud, and trying to hold on to every moment, knowing that it would be over so soon. One of my favourite parts was the cotton candy window display, which were quite an adventure to make using chicken wire, papier mache, cotton batting, and spray paint. Each one ended up being about 5ft tall, and I took them all home with me even though I have absolutely no space for them.